In this post I am going to look at how I created my first drum track. I have included a video that covers all the steps from starting with a blank project in your recording software to programming your first track. If you want to follow my steps then I recommend you download the printable cheatsheet so that once you have watched the video through you can have it to hand when creating your own. 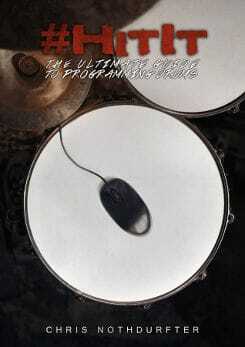 I also talk about a really useful book on programming drums I used to help me get started, and you can take a look at that too. Finally you can grab a copy of the GM2 Drum Map I used, which is a simple text file you should be able to import in any DAW (Desktop Audio Workstation like Reaper) to customize the note names if they aren’t already included. If you don’t have a GM2 Drum Kit and are following the tutorial using the MT Power Drum Kit, then you should download the MT Power Drum Kit Map. If you’re anything like me then the idea of programming your own drum tracks is scary. If you’ve never played a drum to save your life, and you’re a newcomer to home studio recording, then the whole business of becoming even a half-decent DIY beat maker is daunting. To say the least. As a keyboard player and (wannabe) guitarist I can comfortably record and play around with the instruments I am familiar with. But drums? Beats? Rhythms? I need help with the absolute basics! Lots of fears raise their ugly head and I break into a sweat at the thought of creating my own drum tracks. How do you set up your DAW software to create a drum track? Where exactly do you start in that empty space? How do you avoid it sounding cheesy and, well, like a newb who has never created their own beats before? How can you become the God (or Goddess) of Beat Makers when you don’t know even the 1st thing about how to play the drums? So I have been skirting around the idea of going anywhere beyond the drum loop libraries. Then I came across Chris Nothdurfter, who’s written a complete book on the subject of drum programming, and I decided once and for all the time had come to get over myself and get on with it. Yes. I finally rolled up my sleeves and created my first drum track. I learned a lot in a short space of time, and really enjoyed the process too. So much in fact that I decided to put together a step-by-step tutorial of exactly how I did it so that you can too. Once you have your first basic track, then you can quickly move on to more complex rhythms and fills having mastered the basics. Chris’s book takes you step-by-step through the process from beginner to advanced. If you are interested, it is available for immediate download as an eBook, or if you prefer to have a hard copy next to you, it is available in paperback too. Trust me. If I can learn how to play virtual drums then so can you. So here goes. So how did I do it? First off, I read the opening sections of Chris’s book , where he covers all the different kinds of drums in a typical kit. In the first instance I went right up to the part where he shows you how to set up your DAW (Desktop Audio Workstation or recording software) for drum programming. Chris is a guitarist who found himself in need of creating his own drum tracks to accompany himself, and over the years he has become a complete expert in this area. Although he comes musically from a Death Metal background (nobody’s perfect…) he has experimented with all genres and covers many of them in his book. So whatever style you are into, you should be able to create your own drum tracks to suit with his help. Plus nothing like a bit of cross-fertilization of genres and ideas to create something unique to you. His guide is great for someone like me because Chris has a good clear understanding of how to program drums from the perspective of a non-drummer or a complete newcomer. He really helps to build your confidence. Now if you are not sure how to exactly go about setting up your DAW – and Chris does go into this in his book – I have put together a quick tutorial video above so you can see how I went about it. This video shows you step-by-step how to program your very first drum track in Reaper Software. Reaper is great if you are just starting out because you get a FREE 60-day evaluation of the software. Plenty of time to have a go at this beat making lark for free and see if it’s for you. I’m confident you will become an addict. Although I use Reaper here, the steps would work whichever DAW you are using, the principles are universal, you just might have to do a bit of searching to find the equivalent commands if you are using Cubase, Pro Tools, Logic, Mixcraft or something else. Once you have created your first simple track, it’s time to go back to the book, #HitIt – The Ultimate Guide To Programming Drums (nice title Chris), to get beyond that first kick-snare-kick-snare pattern. The way his book works you create your first track as above, then Chris helps you build up your beats, step by step, genre by genre. Starting with Pop he goes on to cover: Building the beat; Hi-hat barking; Tom beats; Sidestick; Half-time feel; The Ride cymbal; Bass drum variations; Pop fills; and Crash cymbals. Moving on to Rock, he then goes on to look at: Snare drum Comping; Ghost notes; Advanced fills; Triplet fills; and Ending fills. Of course there is a whole section on Metal, including: Locking-in with palm muting; Double Bass drum beats; Blast beats; and various Metal fills. Once you have mastered the programming part, Chris then talks about quantization and humanizing your tracks and even includes bonus chapters on odd time signatures, and mixing tips. All in all, I can really recommend the purchase of #HitIt if you are keen to dabble in creating your own drum tracks. It helped me get over my fear and whatever else it was that stopped me from getting started. His claim that the book is the only resource on drum programming you will ever need is not too far from the truth. This will take you a long way before you need to move on. By the way, not only do you get the book with 150 screenshots of groove and fill examples, you also get the additional bonus chapters AND the opportunity to download all the grooves and fills described in the book in MIDI format so you can import them directly into your DAW. You could use all these as the basis for further development once you have mastered the basics. You will get a long way towards being a master of this skill if you work through this book. Still feel daunted? Let me reassure you Chris has a clear, direct style and he really comes from the perspective of someone who has learned how to make their own drum tracks to accompany themselves. He did not start out as an expert drum programmer, but gradually he has become exactly that. Follow him and you can do it too. Nothing you can do that can’t be done! Now go forth and make some beats! 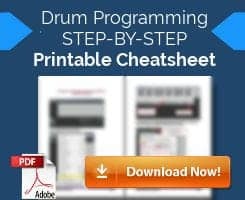 If you liked the video and want to print off a step-by-step cheatsheet to have by your side while you are programming your first drum track then you can download it below. It works through each of the steps with annotated screenshots, so should be really useful. 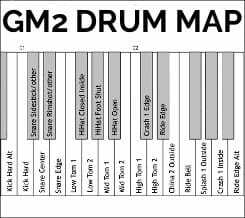 Then there is also the GM2 Drum Map I mentioned. 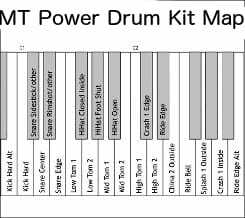 Or, if using the MT Power Drum Kit then you will want the MT Power Drum Kit Map. Finally, follow the link to HitIt and Chris Nothdurfter will give you more info about his book, plus you can download a free chapter to see if it’s for you. Drum programming is not for everyone. For many musicians, it’s got to be the real thing. In this blog I focus mainly on using your computer to record, edit and mix your music because I am a Music Techy. But if you are interested in learning to play the real drums instead, then I’ve found a great site written by a drummer which is perfect if you are a beginner looking to buy your first drum kit and learn how to play. Rock on. Let me know how you get on with your first foray into drum programming in the comments box below. Tell me what you think of the video and if you have any questions then ask. I’m here to help.